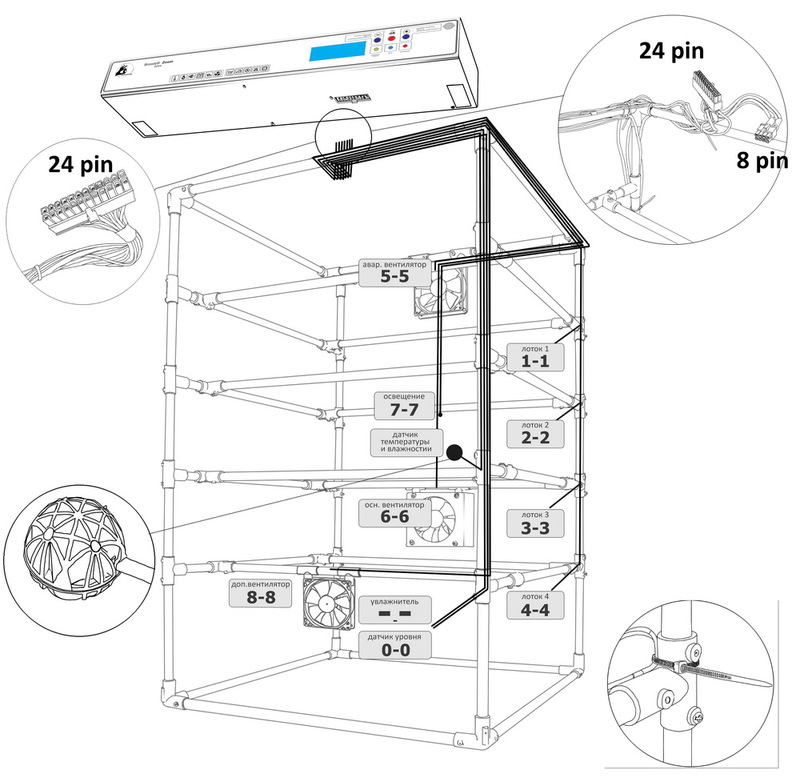 And if the first two modern household incubators quite successfully addressed, the third factor, “fresh air”, belongs to the category of intractable problems.To date, at poultry farmers who breed poultry in a residential area, there is one problem that can not be resolved manufacturers of household incubators – a direct correlation between air exchange and humidity in the incubator. In other words, winding the incubator, we lose moisture, which is difficult to achieve natural evaporation. Incubator Broody Zoom – the first domestic incubator, which, without any modesty, successfully cope with this task. And if listing technical solutions that are implemented in the incubator – then, perhaps, the solution speed dial humidity refers to the most important engineering achievements of the developers. But first things first. So, what is a Broody Zoom? What functionality has the incubator? The control unit (hereafter ECU) has two (2) and the cooling fan is composed of three functional blocks interconnected. The motherboard and a CU control board 183 has component 533 and the soldering point. the temperature control system is based on PID-controller (proportional-integral-differentiating regulator), namely, automatic control with feedback. Power regulation is 255 degrees. Without going into details – this system very accurately maintains a constant temperature (up to ± 0,1 ° C) and eliminates short “hops” temperature. Control housing is made of high quality polystyrene and has fastenings for fixation on the upper faces of the incubator housing. 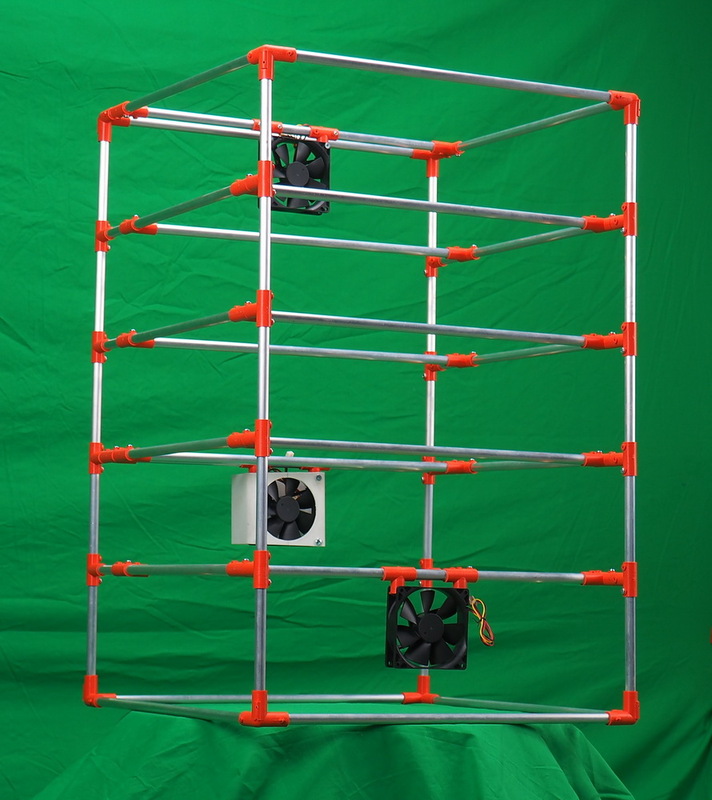 Incubator frame made of aluminum tubes with a wall thickness of 1 mm. It supplied unassembled. Very easy. Going 15-20 minutes experienced craftsman, and newcomer 45-60 minutes. For convenience and ease of assembly, the manufacturer of the frame elements are supplied fully assembled. The connecting elements are made of plastic (polyamide), resistant to high temperatures and aggressive environments. “Floors” trays formed in the framework with appropriate air circulation. The frame 5 has horizontal branches 4 for trays and one for air preparation (mixing and wetting). 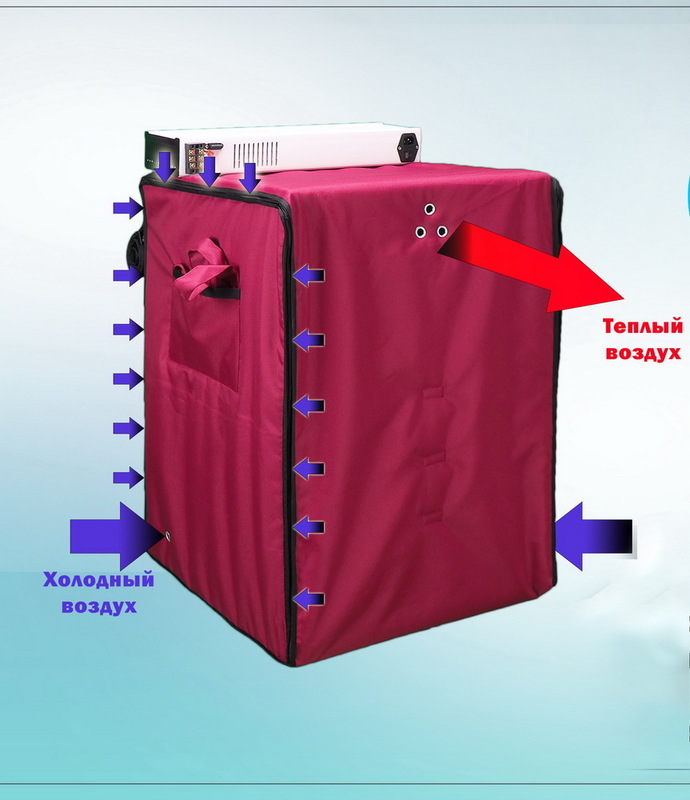 Case incubator made of special strong polyester fabric with a higher density water-repellent properties, used for manufacturing leisure equipment, bags, backpacks. It has a density of 600 DEN. On the front cover of the valve has a viewing window made of a transparent flexible film of silicone film. On the sides of the vents located inflow at the rear – ventilation hood opening. On the sides of the pockets are located and carrying handles incubator. Case for cleaning and disinfection can (and should :-)) washed in automatic washing machine. Thermoheater incubator is in the form of mat (mat) covering side and upper side of the frame. Termomata heating elements are made of carbon fiber having a low thermal inertia. Large area 22h46 heating elements provide a “soft” and uniform heating of the entire volume of the incubator without zones “subcooling” or “overheating”. Low operating voltage 12c provides user safety from electrical shock. Fastening thermal mat to the inner surface of the incubator cover by means of “Velcro”. 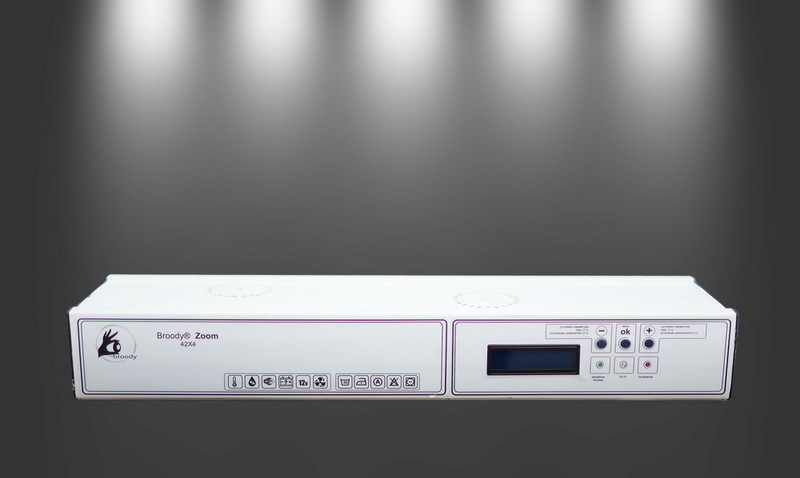 The incubator used industrial precision temperature and humidity sensor based on low-K dielectric polymer. The sensor is characterized by stable, low hysteresis, temperature characteristics and the humidity indicators with a small drift. The sensor does not require calibration for the entire lifetime, as factory calibration is stored on the sensor chip. Zephyr – collected into bundles wires for power supply and output of information to different consumers. Main connector stub MiniFit – 24 pin, connector termomata – miniFit – 8pin, other connectors – 2 pin. 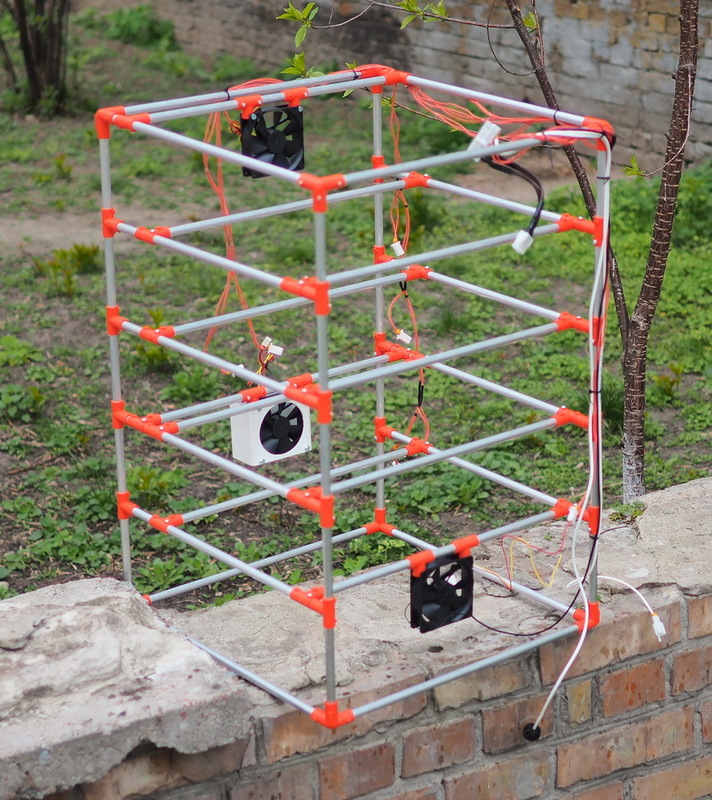 wire loop attached to the frame by means of standard plastic protracted harnesses. 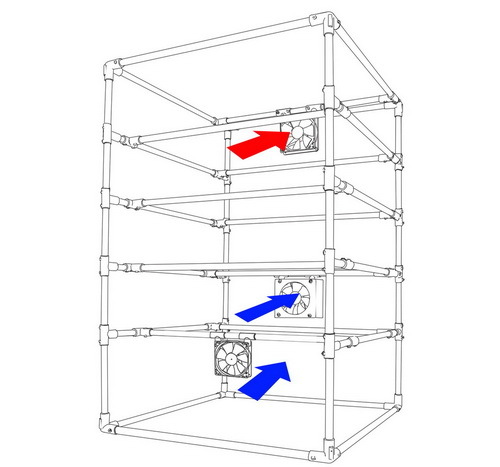 Primary fan made in the case of special cone (aerostrimmera) and provides uniform mixing of air in the incubator (a temperature difference of up to ± 0,3 ° C). Fan powerful enough – 3.5 watts. 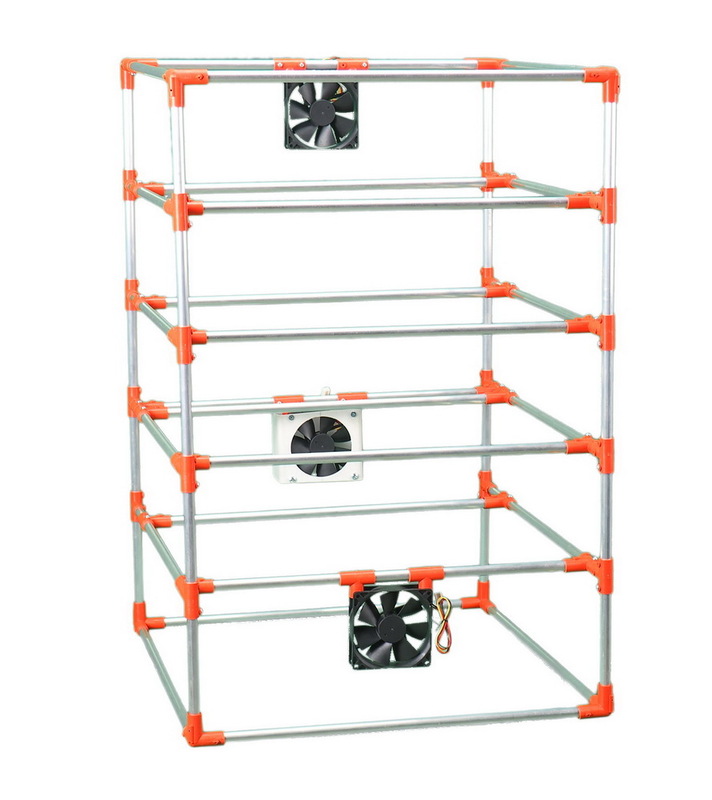 Additional fan (located below the lower floor of the trays) for use incubator at low ambient temperatures from +10 to +20 ° C. Its function is to help effectively stir the air around the incubator volume. At room temperature of 20 … 25 ° C of the upper fan enough work. Emergency fan is used for the sharp discharge in an incubator at a temperature exceeding the set thresholds. Also this fan performs the function of ventilation of the incubator according to the schedule set in the menu. All three fans are interchangeable! Trays carried by cassettes of galvanized mesh without fear of corrosion. Cassette rotation angle – 50 ° -60 °. Capacity mesh trays depends on the size of eggs: max -45 pcs, min -40 pc. The manufacturer has provided the opportunity to use standard Chinese incubator trays of 42 eggs. The engines, which are equipped with trays have 12V supply voltage and the developing revolution force of 7-9 kg. Supplied unassembled. SKD tray takes from 10 minutes to 20 minutes. Capacity humectant – 2.5 liter. Water flow in the humidifier depends on the humidity maintained. For example, at humidity 55% flow-humidifier 28.5 ml / hour (680 ml / day). Filling the humidifier tank is not difficult, both from the bottle and tap. The main feature of the humidifier is its capacity – the humidifier is able to provide a humidity of 70% for 3 minutes after switching on. The maximum moisture content that can provide a humectant – 97%. Thus, even if you often ventilate the incubator, worry about the drop and humidity set is not necessary? The incubator is equipped with light, durable, folding trays cellular penopropilena. Thus, the consumer is not necessary to search for the output capacity for chicks (the final incubation step). Many consumers probably will not like the condition of self-assembly in the working position the incubator. Well, unfortunately, this disadvantage is needed to reduce the cost of delivery between continents. 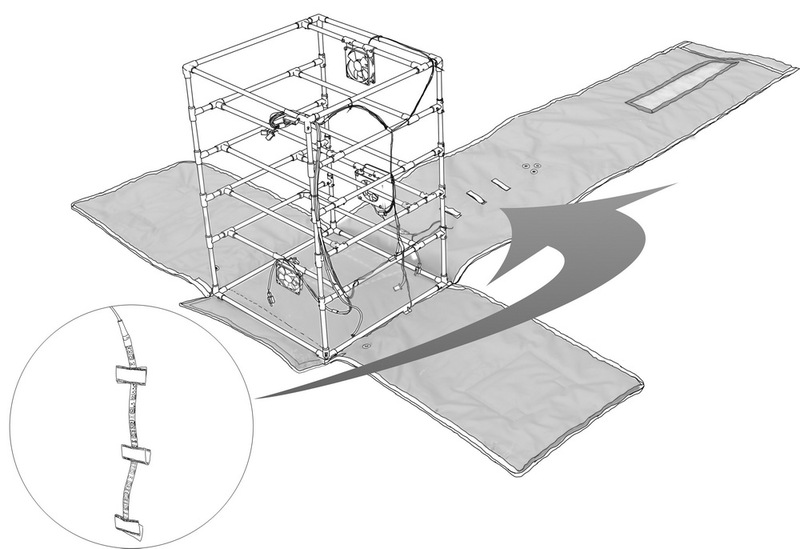 Boxed incubator occupies a volume – 0.07 m 3 and has a weight – 13.7 kg. Some users report too much control unit settings. It is difficult to call it a disadvantage – Opportunities regulation parameters – it is rather a plus. And to simplify the management of the manufacturer announced a choice, “one button” pre-incubation programs: chickens, ducks, geese, quail, etc. It will be implemented soon. It’s time to move on to an analysis of the benefits. easy – 13.7 kg 180 yaytsemest – a record figure for household incubators! unique moisturizerwhich is not in any incubator in the world! With unique performance power and ease of use. Virtually maintenance free during the whole incubation period. Compared with Tenova water heaters used in high-end models of incubators, even it does not make sense. Prefabricated multi-purpose trayfor different kinds of birds. Currently, the developer offers versatile output tray of chicken, duck, Tsesarskaya, quail, pheasant eggs. Soon tray goose, turkey eggs appear. Power supply 12V– this is not a joke. You have seen in the bath (steam room) power supply 220V? No. In rooms with high humidity the use of voltage above 45V PROHIBITED electrical codes of all countries! Now, imagine what is happening inside the incubator with humidity, for example 90%. And imagine that you need to climb to get the trays, select the eggs and chicks transplant. And all 220 volts on motors, fans, heaters … That’s why the manufacturer chose for his incubator minimum supply voltage – 12.
backup power supplyEven in the European Union (EU) and the United States (USA) there »Blackout” s – emergency power outage, and this – the threat of losing the entire tab incubation of eggs. 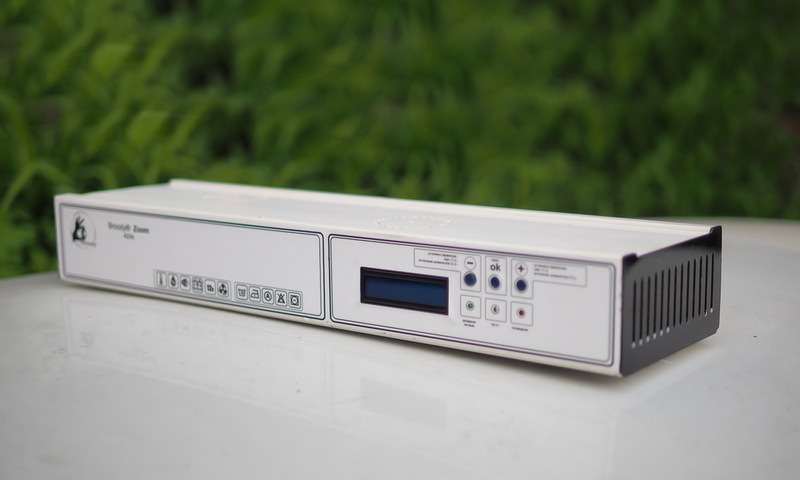 Broody is equipped with an automatic system of backup power during mains failure. When you turn on the network control unit switches to battery charging mode with protection from overcharging. the InternetThe convenience of remote control indicators incubator appreciate only one who is at least once tried. Up to this point, the need for Wi-Fi translator module is assessed as not paramount. But after the first night of incubation, the importance of this function can not be underestimated. Wherever you are – you control the screen of your smartphone all: temperature, humidity, discharge-charge, power, time. One impression – very comfortable and important. In fact, if you have the incubator 100% automatic, you can leave it for a few days and leave. )) In this case, you will always be aware of what’s going on in the incubator. Disinfection It is no secret that the wash foam incubator – a big and unsolvable problem 100%. With wood, the same story. Broody Zoom just washed in the washing machine. Fast, clean, with a guarantee of disinfection. Design If the incubator – it is usually done with an ax (exceptions are incubators R-com Korean firms, Italian and English NOVITAL Brinsea.) Block Broody Zoom control – elegant representative of the “space” design. )) There are no clumsy tumblers and automotive switches. 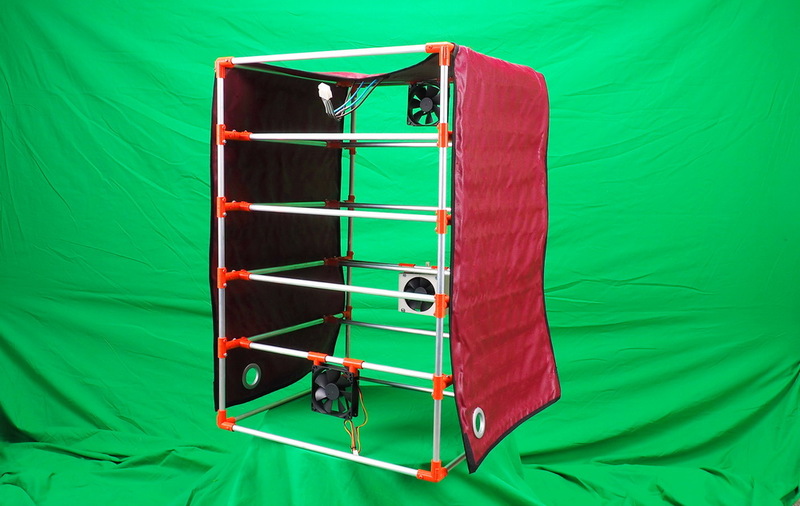 Incubator itself is associated with a “house for the birds”, as is made of high quality thick fabric bright colors. aluminum frame perfectly matches the orange plastic fasteners. Well, transparent and lightweight design humidifier raises questions about the functionality of this unusual instrument. Conclusions:An impressive list of features incubator speaks for itself. This set of functions with respect to capacity and versatility, we have not found incubators producers in any country of the world. Actual results in practice, convenience, flexibility, security, force the user to believe that he was not mistaken in choosing a modern incubator. Balanced price of the device makes it possible to achieve full cost recovery incubator for 6 eggs bookmarks. The manufacturer tried to do everything possible, up to the smallest detail to the incubator broody Zoom was the most convenient for the person and, judging by the reviews of Poultry Farmers, he succeeded. We wish you all a great brood of chickens with the incubator Broody!